Wales named the most environmentally friendly area in the UK by a leading vegan charity. Research published by a leading vegan charity today shows the Welsh are the most environmentally friendly group surveyed, with all respondents doing at least one thing to help the environment on a weekly basis. Worryingly, The Vegan Society’s research also revealed a staggering 77% were unaware that farming cows and sheep is a cause of climate change. The survey of 2,000 UK adults showed that even fewer people knew that livestock production results in extinction of other species (8%) and causes destruction of the rainforest (12%). When it comes to making a permanent lifestyle change, 1 in 5 respondents (19%) said they would consider becoming vegan while the UK’s current vegan population is around 1%. 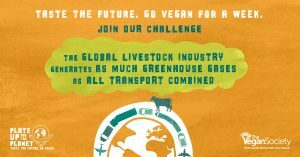 The charity is launching its environmental campaign Plate Up for the Planet today and urging people to “eat to save the world” as the global meat and dairy industry is responsible for as much greenhouse gases as the transport sector combined. Louise Davies, Head of Campaigns and Policy at The Vegan Society, said: “We’re always told to change our light bulbs, cycle to work or take shorter showers but the huge carbon footprint of animal agriculture is largely ignored when it comes to fighting climate change. 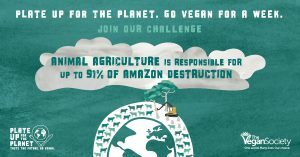 “The Vegan Society wants to address this pressing issue with our Plate Up for the Planet campaign which encourages people to think differently about what they eat and how it impacts our planet. The survey showed that Brits are a green bunch, with 95% doing something on a weekly basis to help the planet. Environmentally-friendly habits include recycling (78%), turning the lights off when they are not using them (65%) and taking re-usable bags to the supermarket (58%). A further 41% make an effort to walk or cycle inside of driving, 49% use eco bulbs, 54% turn off the taps when brushing teeth and 51% only boil as much water as they need. But despite our good, green intentions, we’re less conscious of what we put into our mouths with eating less meat (15%) and eating less dairy (8%) ranking as some of the things we’re least likely to do. The Welsh were the most environmentally friendly group surveyed, with all respondents doing at least one thing to help the environment each week, compared to 11% in the North East who admitted they did not do anything on a weekly basis. Leading authorities on climate change, including the United Nations’ FAO and Chatham House, have warned it is unlikely that global temperature rises can be kept below two degrees Celsius in the absence of a radical shift in meat and dairy consumption. The Vegan Society is urging the public to eat efficiently as for every 100 calories fed to animals, we receive back only 12 calories by consuming their meat and milk. 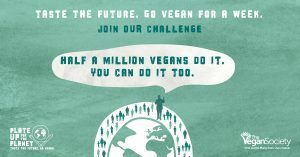 To try the seven day vegan challenge as part of #PlateUpforthePlanet, sign up for free with your email address at www.vegansociety.com/plateup. Celebrities who have taken the challenge or are supporting the campaign include Made in Chelsea’s Lucy Watson, Green Party leader Caroline Lucas and Harry Potter star Evanna Lynch.